Do you enjoy singing in the rain? How about running? Rain is bad news for many runners. The drops soak even the best of equipment, making it hard to finish a race or even to practice without resembling a straggly cat that didn’t make it inside in time. Perhaps the most important piece of equipment for running in the rain is a person’s socks. Socks can make or break some of the best runners. They are a barrier against blisters, the epitome of comfort for worn feet, and a veritable plague if they get too wet. 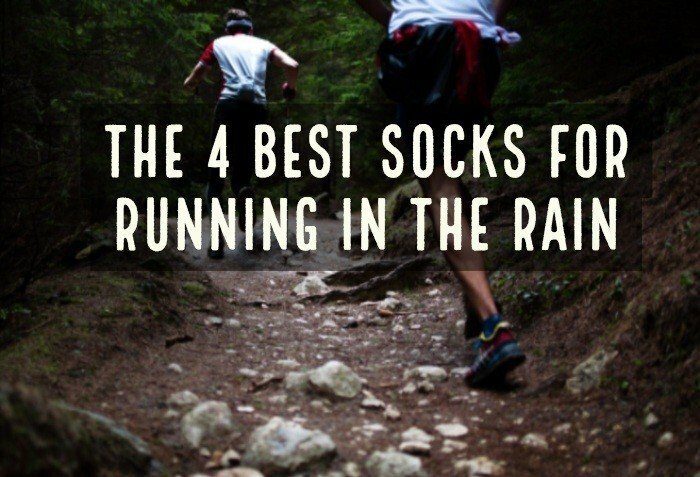 Thankfully, many manufacturers have heard runners’ prayers and now make specialized socks for running in the rain. Several scientific articles, including one by Hamill and Gruber, have found that runners benefit from forefoot and midfoot strikes, which is where most of the pressure will be. This also means that these areas will suffer the most in the rain. An important part about choosing running socks is finding a pair which will support these two areas without including tons of unnecessary fabric. The combination of moisture and material can cause numerous problems. Wet feet are a wasteland are conditions and problems for athletes. Some of the most common are blisters, Athlete’s foot, and infections in runner’s toes. According to the Mayo Clinic, Athlete’s Foot is a fungal infection commonly seen in active people. One of the main causes is running in unclean and damp socks and shoes. Fungus thrives in moist, dark environments, and sometimes a runner’s shoes resemble this hazardous biome. Blisters are fluid-filled lumps on the skin caused by excessive moisture or use. The American Academy of Dermatology recommends that people of all ages wear moisture-wicking socks to keep the feet dry, and to also avoid excessive chafing by using comfortable footwear. Runner’s toes actually refers to a condition where blood vessels break or there is bleeding under the toenail. This area is vulnerable and susceptible to infection because people cannot reach the damage to treat it. Wet socks can transfer bacteria from shoes and the feet to the affected region and cause severe problems. The one aspect all of these problems have in common is that wet socks either cause them or make the issue worse. If you know you’re going to be running in the rain and want to avoid some serious problems later on, it’s important to find the best coverage possible. It describes how runners need to pay special attention to the toe and forefoot areas of a sock to prevent blisters and bunching. An excessive amount of wet fabric can cause discomfort and increase the chances of blisters or Athlete’s foot. Now that you know what to look for, here are some of the top brands and models for running in the rain. Below is a review of each of the socks listed in the chart below. These are a personal favorite because of their comfort, fit, and ability to wick away moisture. Because Drymax styled these socks for runners used to hoofing it on trails, they are more durable than the typical gym sock. They are also excellent at moving sweat and rain away from the feet so athletes can continue to move in comfort. The product additionally has a tighter fit than some variations and prevents excessive fabric from rubbing against the toes and forefoot. 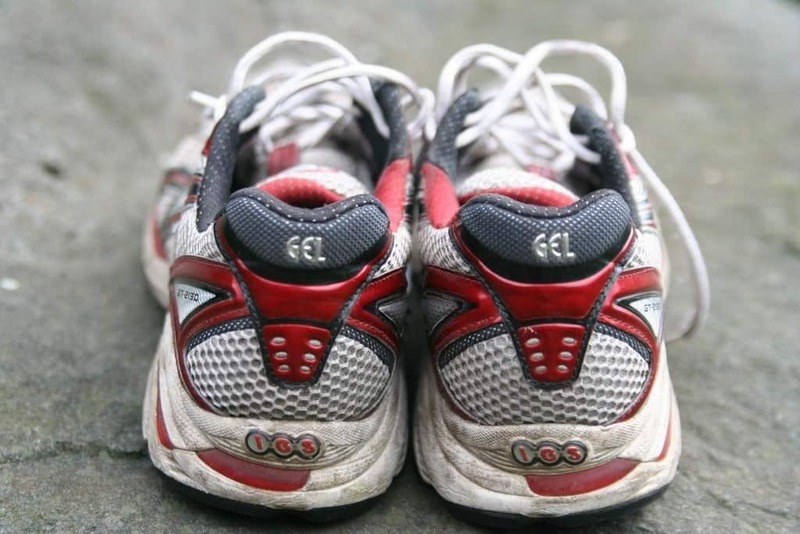 This can help prevent blisters and infections while still giving the feet enough cushioning. Most of the trail socks also lack vents to stop dirt from entering and causing further irritation. The Drymax trail running socks are inexpensive considering the quality. Unlike some other products, they also come in multiple styles ranging from no-shows to crews to knee-length. Not only is the name fun to say, but these socks are fun to wear. Out of the products available in the United States today, these are probably the most effective at keeping feet dry in the rain. They wick away tons of water and sweat without adding too much extra weight to the feet. The socks additionally come with arch support and bands around the feet for maximum comfort. The support is not disturbed by liquid, so the extra comfort continues even in wet conditions. There is also a toe seam that helps prevent friction, which stops blisters and runner’s toe in its tracks. 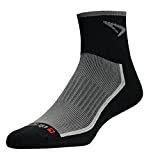 Swiftwick has several different styles, but the crew socks are popular for their ability to keep the lower legs warm without suffocating the skin. These are a favorite among athletes for their comfort and ability to keep the feet warm. Unfortunately, no amount of science has figured out a sock that can keep feet dry and comfortable in the rain. The Merino Wool Cushion Quarter from Feetures is a wool sock that manages to remain pleasant while avoiding the nastiness of being soaked. EXTREME COMFORT: Our Elite Merino+ socks combine our Elite technology with our unique blend of super fine merino wool and silky soft rayon from bamboo as well as a seamless toe that provides truly unsurpassed comfort. DENSE CUSHION: High density cushioning provides extra protection in high impact areas. TEMPERATURE CONTROL: Merino+ fibers wick moisture to keep feet dry and odor-free. These socks insulate when wet which keeps feet warm in cool and damp conditions. Unlike cotton, wool doesn’t absorb moisture so feet can remain dryer for longer periods of time. These Feetures socks additionally have some extra cushioning without being loose, which can help combat blisters. The only downside is that wool tends to be warm, so they might not be the best for a summer run. Be sure to do some shopping around before you settle on a seller. However, the socks are a long-term investment, as many runners found that they can last for over a year with repetitive use. 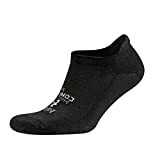 These socks are for men and women and tend to be thinner and smaller than other models. They come in a variety of models, but the best for running in the rain are the Hidden Comfort because they remain soft and cushioning even when wet. Like many other products in this article, they also wick away moisture to prevent runners from having to slog through puddles in their shoes. The Belega can also be purchased cheaply and frequently come in sets of three, so they are interchangeable and can be cycled so runners don’t have to wear the same socks all of the time. Many athletes additionally appreciate that there are designated Right and Left socks to promote proper sizing and fit. If you have a run going up and know that it will be raining or storming that day, it’s important to be prepared. Most manufacturers of athletic wear market their socks as “all-weather,” but this simply isn’t true. You need to find a style that fits correctly while also eliminating as much moisture as possible. These four socks are some of the best in the industry and aren’t too expensive. If possible, measure your foot before you choose a pair so you can find some that won’t have excess fabric. Your comfort in the rain is important, and you shouldn’t cut corners when it comes to your health.